Portland leaves nine runners on base, including two in the ninth with one out in a one-run loss to New Britain. PORTLAND – Before Monday’s game, catcher Luis Exposito was scratched out of the lineup. Exposito, one of the league leaders in RBI, had a stiff back. Too bad. The Portland Sea Dogs needed a couple more clutch hits. New Britain’s Joe Benson is tagged out at third by Portland’s Ray Chang after trying to steal in the first inning Monday at Hadlock Field. The Sea Dogs were beaten 4-3 and enter the All-Star break 10 games out of first place. 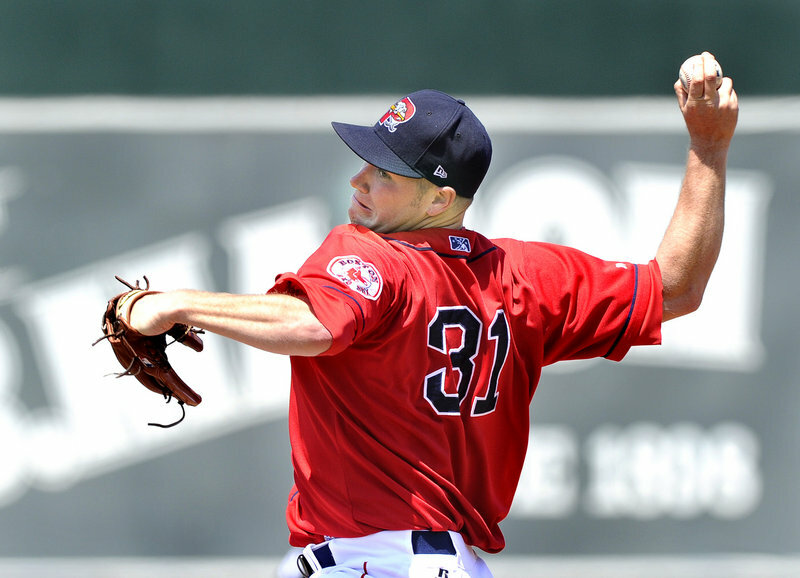 Alex Wilson of the Sea Dogs threw 93 pitches Monday and was lifted with two outs in the sixth after allowing eight hits and three runs with three strikeouts and no walks. 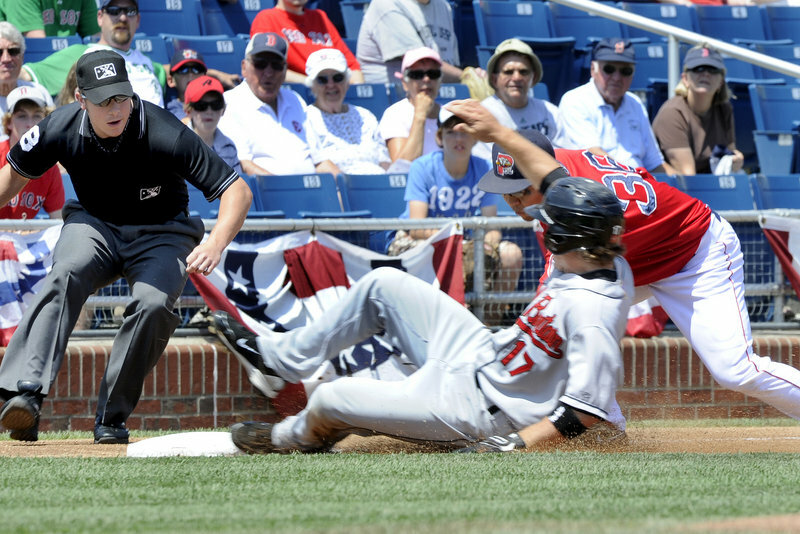 Joe Benson had a rough day on the bases for New Britain, this time being tagged out by Portland’s Yamaico Navarro on a steal attempt in the fifth inning Monday at Hadlock Field. While Exposito’s replacement did fine, the Sea Dogs still did not do enough against the New Britain Rock Cats, who bused out of Portland after a 4-3 win over the Sea Dogs. Heading into the All-Star break, the Sea Dogs are 44-46, in fifth place in the Eastern League East Division, 10 games out of first, and 81/2 games away from a playoff spot. The only team in worse shape in the division is New Britain (25-65), which split a four-game series over the long weekend at Hadlock Field. 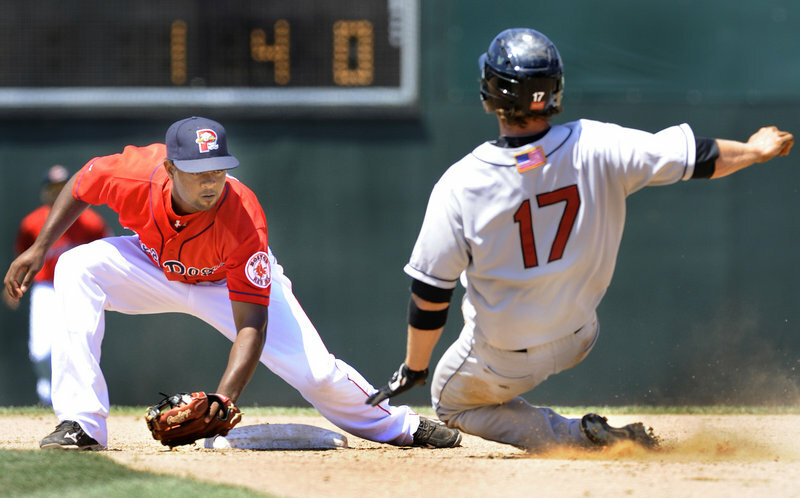 Portland outhit the Rock Cats 10-9, but left nine on base (to New Britain’s five). “We had some opportunities,” Sea Dogs Manager Arnie Beyeler said. Both pitching staffs showed control with three walks total, but the one pass issued by Sea Dogs reliever Ryne Lawson (5-3) proved to be the winner. With the score tied 3-3 in the eighth, Lawson walk Yancarlos Ortiz. Then with two outs, Chris Parmelee doubled him in. The Sea Dogs threatened in the ninth when Will Vazquez’s one-out double was followed by a walk to Che-Hsuan Lin. But closer Bill Bullock struck out Nate Spears and Yamaico Navarro for his fifth save. Former Sea Dogs reliever Chris Province (4-1) picked up the win for New Britain. Portland starter Alex Wilson put in a solid 52/3 innings innings, allowing eight hits and three runs, walking none, striking out three. Wilson used his fastball, slider and change-up for 62 strikes of his 93 pitches. In three of his last four outings, Wilson has allowed three or fewer runs. Two singles and a double gave New Britain a 2-0 lead in the third. Vazquez’s RBI single to right field closed the score to 2-1 in the bottom of the inning. Vazquez went 3 for 4, improving his average to .184. Vazquez, one of those needed versatile players on a minor league roster, can catch and play both the infield and outfield. He does not play often (34 games this season) but is expected to perform when called upon. Alexander Soto homered off Wilson in the fourth. Portland eventually tied it with a run in the fifth (Spears’ RBI groundout) and the seventh (Spears’ RBI double, scoring Vazquez). After Spears’ double, Portland had runners on second and third with one out, but Navarro popped out in foul territory and Anthony Rizzo grounded out. The Sea Dogs were 2 for 12 with runners in scoring position. NOTES: Shortstop Jose Iglesias had the severe bone bruise in his right hand examined again Monday. Iglesias said he should begin hitting a baseball off a tee later this week, but is still weeks away from playing After the game, reliever Santos Luis (5-1, 2.72) was promoted to Triple-A Pawtucket. Luis was claimed on waivers from the White Sox in April. While the coaching staff and most players get two days off, four players are headed to Harrisburg for Wednesday’s Eastern League All-Star Game — infielders Spears and Ray Chang, starter Stephen Fife and reliever Jason Rice. Fife, who pitched Friday, will participate in the ceremonies but not the game.